I’m not sure if I’ve seen this before – but some good stuff here. I particularly like the fact that there are prices on this website – many guitar makers don’t publish this info. Jeremy Spencer records new album – and his new custom guitar too. Got to get this CD. At the current exchange rate, around £1500 – still a tad expensive, but I am interested in how it might play and sound. You’d need a whole team of roadies! 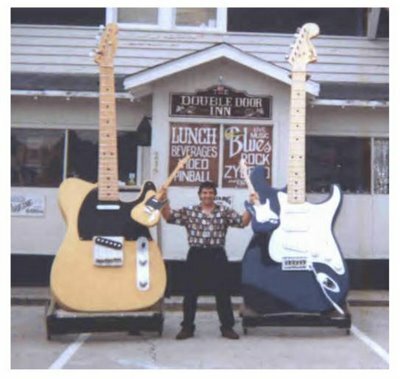 Giant Guitars That Really Play!!! What a pity they aren’t real – are they?